Kamal was born in Iran in 1964 and later moved to Canada. He discovered photography on the streets of Shiraz, where his youth was marked by the Revolution. When he was drafted into the army and while he was stationed for military service during the Iran-Iraq war, he discovered his interest for documentary photography. Under the mentorship of Chehrenegar, a renowned Iranian photographer, Kamal began taking photographs depicting the social and political aspects of life in Ayatollah Khomeiny's Iran and had the opportunity to further his search for his own photographic identity. His principal motivation has been to capture fleeting, historical moments and to share them with a broader public. 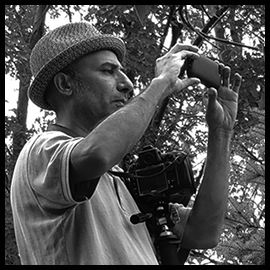 Kamal has been a freelance documentary photographer since 1991. Kamal's photographs have been published in a variety of Iranian, North American, and European media, including books, magazines, and newspapers. His work has also been displayed internationally at individual and collective exhibitions and is to be found in several public and private collections. In 2003, Kamal moved to Montreal, Quebec, where he had the opportunity to learn French and to dedicate himself to a long-term project on cultural identity, in the setting of changing policies on multiculturalism and immigration in Quebec. His intimate documentary work with Stanley Lewis, a renowned Quebec sculptor, garnered Kamal recognition from the Montreal Museum of Fine Arts, where he was exhibited in 2006. Kamal currently divides his time between Montreal and London, England, where his family resides. 2016 Landscapes, Views and Perspectives. Mount- Royal Park, Chalet du Mont-Royal, Montreal, Quebec. May 9 to October 30, 2016. 2016 2016 Pure Presence, Negahe-no Art Gallery, Isfahan, Iran. 2016 2016 Pow-Wow, Vesal Art Gallery, Shiraz, Fars, Iran. 2014 Photographic exhibition First Nations: Proud of our heritage! 2014 Montreal: Salon des arts autochtones || Aboriginal Arts Fair December 09, 2014 at La Plaza – Holiday Inn Montreal MidTown – Groupe PMG in Montreal, QC. 2013 Date	December 6, 2013 - September 28, 2014. SNOW: A group exhibition at the Canadian Museum of Civilization. An exhibition created by the Canadian Museum of Civilization in partnership with the J. Armand Bombardier Museum. OTTAWA, ONTARIO, CANADA. Copyright 2019 © Photofade. All rights reserved. Developped by Les Technologies Reweb Inc.